For the money, the GrandMeister represents a hard-to-beat slice of modern amp technology for the serious player. A compact and portable head with so many features the possibilities are practically infinite. We wish there was Wi-Fi inside the chassis to make the editing app more accessible. Around five years ago, when every manufacturer was adding steel-cased lunchbox amps to their catalogues, you just knew that when Hughes & Kettner got round to it, it would do things its own way - and that's exactly what happened with the introduction of the TubeMeister range. Not only did the TubeMeister have all the features you could ask for, it looked and sounded amazing. Never being the kind of audio company to rest on its laurels, after five years of success Hughes & Kettner has revisited its best seller and made it even better. The result is the GrandMeister 40 Deluxe. The GrandMeister has the same smart steel case and Perspex control panel featuring nine knobs and a big four-way rotary voice switch. With the exception of the master volume, everything is MIDI-powered, so you can edit and store presets to your heart's content. MIDI also controls the built-in five-step attenuator, series effects loop, boost voicing and studio- quality built-in digital effects. The rear panel includes the latest Red Box recording output, with balanced and unbalanced connections and Ambience Emulation. There's also a new improved iPad app that you can use to edit and store presets, either at the end of a lead or using a wireless MIDI adaptor. With no discernible difference in assembly quality between the Chinese-made GrandMeister and Hughes & Kettner's home-grown high-end products, the GrandMeister Deluxe 40 has a reassuringly robust appearance that inspires confidence. This is a serious tool that's designed and built to withstand many years of use and abuse. The GrandMeister Deluxe 40 powers up with minimal hiss on the Clean and Crunch channels and only slightly more on the Lead and Ultra channels. The preamp has been redesigned using what Hughes & Kettner calls Deluxe Tone Technology, a concept inspired by the all-conquering TriAmp Mark 3, which structures the gain to create more headroom in the clean and crunch voices, with less of a 'gain gap' between them. The GrandMeister Deluxe 40's four channels sound quite different from those of its predecessor: they're more balanced, with slightly less treble emphasis and a smoother but no less powerful bass response. There's plenty of headroom on the clean channel, which dovetails seamlessly with the higher-gain crunch channel. The channels sound quite different from its predecessor's: more balanced, with slightly less treble emphasis and a smootherbut no less powerful bass response. Both clean and crunch are very tweed-influenced, dominated by a warm midrange that's equally flattering to humbuckers and single coils, especially when boosted and laced with a little of the GrandMeister's digital reverb, which can be combined to taste with delay, chorus, flanger, phaser or tremolo. All the built-in effects are very usable, if a little lacking in character. However, the series effects loop can be programmed on or off for each patch, so you can still use your favourite pedals with it. The two American-voiced lead channels have all the gain you could possibly need for almost any musical genre, from classic rock to modern drop-tuned metal, with a nicely sculpted top-end that squeals and snarls on demand. The built-in noise gate does a decent job of squashing the hiss on higher gain settings and the new, thicker voicings sound equally impressive with regular single coils and PAF-style humbuckers. The Ultra channel's attack isn't quite fast enough for extreme metal chording, but it's very close. Metal players with higher output, dark-sounding pickups might need to resort to more extreme tone settings, but for the most part, the tone knobs have all the best sounds in the centre third of their travel, with a smooth, predictable interaction and plenty of range. As a do-it-all tool the GrandMeister 40 takes some beating. All of its many features work efficiently and it's hard to point the finger at shortcomings, because there really aren't any. Okay, we admit that the iPad app would be more attractive if the GrandMeister's Wi-Fi was built in rather than a bolt-on, and the top of the steel cabinet gets very hot from radiated EL84 heat, so it might be a good idea to put some insulation underneath it. But, really, those are the only things we can muster faint disapproval for. Tonally, it's noticeably different from the older TubeMeister 36. The new preamp's better-defined gain structure easily covers almost all musical genres with authority. And, considering all its features, it's exceptionally good value for money. 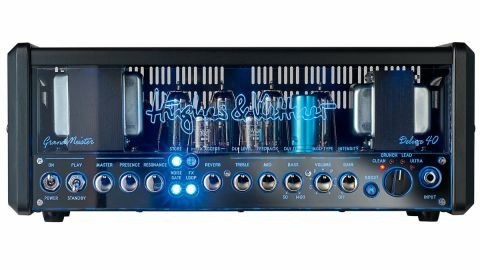 Has Hughes & Kettner done the impossible and improved on an amp that was already practically perfect? After many hours of playing, in live and studio environments, we'd have to say, yes, it has indeed.